Do you enjoy helping women look and feel Beautiful? Call Nancy at (860) 289-8191 or 1 (888) 457-8797 to Learn more about partnering with us . want to be a professional makeup artist? no experience, necessary ongoing professional training, freelance, flexible hours, carry custom blended cosmetics, diversify services and product base, customblend foundation, mineral makeup and color line, anti-aging skin care, 30 to 200 percent retail profit and commission. 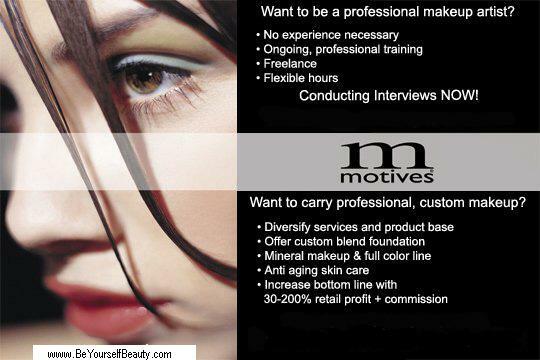 Motives Cosmetics was introduced in 1997 and has grown into a hugely popular, customizable cosmetics line. By using innovative color combinations and customization, Motives Cosmetics has developed a loyal following that includes world-famous celebrities and everyday women that simply want to look their best at an affordable price. In January of 2012, NBA wife and reality show star La La Anthony added makeup maven to her resume when she partnered with longtime friend Loren Ridinger, creator of the award-winning Motives® by Loren Ridinger® cosmetics line, to create Motives® for La La, a line of makeup uniquely-formulated for every shade of today’s modern woman. Motives by La La will feature mineral-based foundation, lipstick, blush, eye shadow, face shimmer and lip gloss formulated with an emphasis on Latina and African American women. “Every girl always tries to find that perfect color or shade that suits their personality,” said Anthony in a news statement. and Motives by La La Unique? Today's busy pace, along with the high expectations of modern lifestyles, place a premium on looking your best in a variety of situations. As an essential tool in every woman's fashion ensemble, the selection of cosmetics that accentuate a woman's specific coloring is crucial. This selection process is seldom easy and frequently frustrating, usually involving crowded retail stores, impersonal service, overpriced designer products and a nagging doubt over the typical trial-and-error approach to makeup selection. "But it looked so good in the store!" is the cry of many women. Does this ring true for you? Are you craving an alternative solution that respects your time, your preferences and your wallet? Discover choice, innovation and a customized look in the world of Motives cosmetics. Motives hypoallergenic and non-comedogenic cosmetics offer you cutting-edge style, vivid color and a wide variety of attractive makeup choices. And, this offer comes by way of personalized service from a knowledgeable Make-up Artist. With the help of our trained Artists, you can begin the Motives experience with the creation of a Custom-Blended Foundation that perfectly matches your skin tone. That's right, no more guesswork! You then take a twirl on the Motives Color Wheel to discover which colors best suit your eyes, cheeks and lips. These color selections point you toward an extensive array of Motives color products -- lipsticks (cream, sheer and long-wearing), lip glosses, liners, shadows (pressed and cream), mascaras, blushes (pressed and cream) and many more - that round out the palette of colors and products that meet your personal needs. This sounds exciting, doesn't it?! Then, why don't you start your Motives experience right now?! Don't wait another minute - discover the Motives difference today! As a Motives Cosmetics representative, you have the opportunity to run your own cosmetic business as an independent beauty representative. You decide the level of commitment you want to make and the hours you want to work because it is your business and you are in control. We give you access to ongoing training and support through our local, regional, national and international business development systems. So, you're in business for yourself, but you're not by yourself. With our unique business system, you will earn the BEST compensation in the industry. If you are out-going, love to have fun and meet new people, love helping women look and feel their best, and are open to new ideas, this could be the opportunity you have been looking for! Be Yourself.....Be One of a Kind and Yet Part of Something Big!! You determine your pace, your development and your level of success. Many of our Artists are busy young mothers who fashion their business around the needs of their families. Some of our Artists have used our opportunity as a replacement for a "second job" because it offers such high earnings and flexibility. Others have taken this business and embarked on this opportunity as a second career, making full time incomes. With Motives and Be Yourself Beauty, you can be one of many, and still be one of a kind! We treasure the values that families hold dear, and we regard our Artists with a high degree of respect and integrity. You'll work the days and hours you desire.....around your personal and family schedule. You set your own goals, hours and you set your own pace. You'll be amazed at the amount of money you can earn....and those earnings increase for most new Artists as they become trained, experienced and more confident in their new role. All Artists begin their career by signing an agreement to work with Be Yourself Beauty and Motives. You can choose one of two ways to build your business. Once you have signed an agreement and received your starter kit, you'll be trained in several ways. You'll view training videos produced by the company; you'll receive a consultant business guide; and, you'll have the opportunity to attend meeting and training sessions. In addition to retails profits made on your sales, you have the freedom to share the opportunity with others, just like your recruiter did. When you meet the minimum requirements, you'll earn commissions and even more money through a management override program based upon your groups sales.